When chic meets adventure, unexpected things can happen. 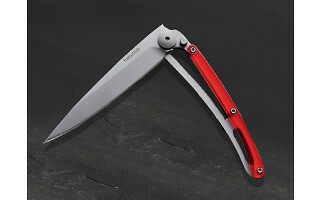 Baladeo pocket knives are uber functional and artfully engineered. The blades are made from 420 stainless steel, which has a high percentage of carbon for sharp cutting and chrome to prevent rusting. There’s a lock that secures the blade in an open position and disengages when you’re ready to roll. Company co-founders Luc Foin and Stéphane Lebeau met as school kids in France and reconnected as adults when they launched Baladeo, which has a U.S. headquarters in Montana. Luc and Stéphane were inspired to create minimalist pieces that are lightweight and streamlined yet also exceptionally strong and durable to satisfy serious mountaineers. A marriage of Parisian elegance and the great outdoors, their pocket knives are ready for any adventure. Greetings to the Daily Grommet community! All of us at Baladeo are very excited to be working with the good folks at the Daily Grommet to bring you our ultra-lightweight G Series pocket knives and outdoor cutlery sets. Inspired by generations of French knife-making tradition, the G Series is the embodiment of sleek design coupled with real world functionality. If famed mountaineers like Conrad Anker feel comfortable taking the G Series to the top of Mount Everest, then surely the rest of us can be assured that the G Series pocket knives are the right companion on any journey. I'll be here to answer any questions you may have, so please feel free to ask away. No need to apologize. We absolutely love that our community has certain ideals to which they stand true. Discovering made in the USA products is important to us as well and we have a category filled with them here. When you come across a great made in the USA product, suggest it as a Grommet by clicking on the link in the header or footer of any page. We've been working with product creators for over four years now and one thing that we've learned is that most would like to have an alternative for manufacturing outside of China, actively look for that opportunity, and move operations when it's possible. Sometimes it's simply not possible, but that's not going to stop these visionaries from bringing their product to life. Luckily, the lion's share of the dollars spent on a product made in China actually stays in the US with the retailers, distributors, shippers, packagers, etc. But you're right, some goes to China. We're glad that you like the design of these knives. We think they are pretty great ourselves. No need to apologize. We absolutely love that our community has certain ideals to which they stand true. Discovering made in the USA products is important to us as well and we have a category filled with them here. http://www.thegrommet.com/products/good-deeds/made-in-the-usa When you come across a great made in the USA product, suggest it as a Grommet by clicking on the link in the header or footer of any page. When chic meets adventure, unexpected things can happen. 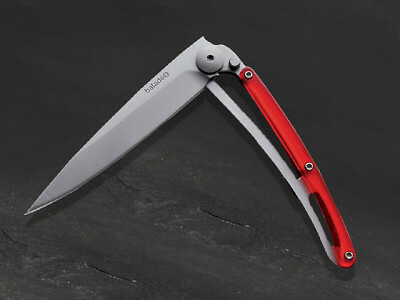 Baladeo pocket knives are uber functional and artfully engineered. The blades are made from 420 stainless steel, which has a high percentage of carbon for sharp cutting and chrome to prevent rusting. There’s a lock that secures the blade in an open position and disengages when you’re ready to roll.